By Lindsayt	| Published on Tuesday, February 8, 2011. Younity presents Shiro, a Japanese nurse-turn-graffiti-artist who combines bright colors with a peaceful disposition. This is Shiro's world, we just live in it. In collaboration with the female artist collective The Younity, FatCap brings to you an artist interview with noted Japanese graffiti artist Shiro. You may recognize her recent work from Art of Basketball, but she's been keeping busy for years, participating in the We B*Girlz festival in Berlin and as a member of the all-female crew SUG. Lets cover some quick questions that our readers like to know: What is the meaning of your name? My name means "uncolored". That means "being original". How do you organize your paintings? Do you sketch before? I like sketching before paint on wall, but i do freestyle too. You show a lot of variety with your characters and letters, how do you work them? My characterz are just like other of myself. I imagine what I wanna be or how I wanna look like^^ My lettering is simple. Shiro balances many different interests and commitments; it is very inspiring and something many women struggle with. How do you have the time to balance your career as a nurse and all the traveling you do as an artist? I work part time. I can get holidays when I need to travel, but I work a lot after I got back. My boss makes working schedule like that for me. My co-workers are very supportive for my activity as an artist. I make some posters or sign for my hospital for appreciation. Body Painting: We’ve noticed that you like to do body painting. When did this start and what do you find fun about it? Do you find power behind body painting? I started this long time ago. Girlz ask me to paint on them, because it's easy to ask me because I am a girl too. People who got painted like to take photos of themselves. I am happy to see tham. Body paint isn't so special for me, but I like that. It's fun. Posca marker is great for Body paint. I like the marker. Community Awareness: First, tell us about your work with The Younity and how you got involved in the organization? I have been friend of Toofly and Alice before Younity was settled. I was in the 1st meeting of Younity, eating lunch Alice cooked for us. Then they got me as a member automatically. I was happy. What have you learned from that organization that you can share with your other organizations, like the B Girl Summit? It's always great to work with girlz, because we can share and have fun not only painting, but also girlz talking, eating, shopping and so on. I am down to SUG crew too. It is an international girlz graffiti crew. We have graffiti tour once in a year. We each have at least one or more tough experiences being a woman in graffiti world, but we can express who we are thorough our artwork. 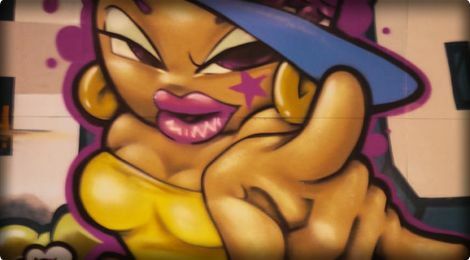 I like represent girlz in graffiti/Hip Hop, telling girlz "Be strong and be free to express ourselves.". What is your interest in these types of projects and why do you think it's important to use graffiti as a medium for conveying their messages? We have to be in a good team to make a wall together. So even I meet somebody 1st time right before we start paint, we can be good friends after we finish to paint. Especially I am totally deaf in my right ear. I like painting more that talking. Shiro has so many collaborations, crews and organizations she is involved with, it’s hard to keep track! She sent us a picture of her collaborating with Sand One. Sand One is young and rocking it right now. What’s it like painting with her? What inspiration do you get from each other and what vibe do you have when you paint together? We have known each other since I met her last year in Miami Art Basel. We sometimes talked via e-mails. I painted with her and we became friends. It's because of my instinct. Music: Shiro is highly influenced by hip hop. Here are some fun questions! If you could paint any musician as one of your Shiro femmes, who would it be and how would you draw them? What was your first hip hop tape/cd? I like underground Japanese hip hop better. There are so many people, so it is difficult to pick some up..
Travel: Shiro travels a lot and has seen so many places around the world, we’d like to know more! If you could have grown up in a different country, which country (and city) would that be? I like my hometown Yaizu-Shizuoka so much. So Can't think other place. I have mountains and harbors, and many stores close to my house. I see Mt. Fuji from my room window. It's the most beautiful mountain in Japan. What are you top 5 travel destinations you haven’t visited yet? Spain, Puerto Rico, Chlle, Africa, India. Not only them, though.. Finally, what's coming up in 2011 for you? Fill us in! I will have small art show in department store in my home town Shizuoka Japan with my friend who is a female writer in February. Also, I am going to SUG graffiti tour in Sydney Australia in March. May be I will be in NY this summer for one or two month. The girl keeps busy! Find Shiro online here and on her blog. YOUNITY was founded in New York City in 2007 by noted artists Alice Mizrachi and Toofly. After spending many years involved in the art world, they came to the realization that women artists do not have a properly-organized forum through which to disseminate their ideas to contemporaries and showcase their work to the public at large. The confines of galleries were too rigid and staid; the ‘white cube’ did not lend much room for personal expression and individual style. They wanted to create a place wherein females could tell their own stories in more universal, down-to-earth voices. They also wanted to build a stable community in which they could teach the next generation what goes into the process of setting up art shows and try to successfully spread artistic ideas. The organization’s name derives from its overarching concept of creating a solid group filled with unique, autonomous participants. Each member has her own flavor, and can retain that identity even in the context of a collective body. Thus, the concept behind YOUNITY was born. The mission of YOUNITY is to create an international collective of female visual artists, designers, photographers and craftswomen. These participants will support each other by joining forces on creative projects, helping to build networks, providing resources, and creating community awareness with the help of young people. It serves as a bridge that results in artistic mentoring, communal support, and the production of collaborative art shows that promote women in the arts.